The New Digital Entertainer from Netgear is the Set-to Box to have this year. If you are looking for a all in one next generation Set-top Box then the Digital Entertainer Live is the gadget to have. Launched on Tuesday the Digital Entertainer Live (EVA2000) is the newest in the internet connected Set-top Box in the Netgear's Digital Entertainer family product family. From the Digital Entertainer Live you can access your downloaded movies, music, access YouTube. Rather than having to watch your online videos on a small computer screens, you and your family can now enjoy your media collections stored on USB storage devices, computers and network storage directly on your HDTV; from the comfort of their couch. In addition to personal media collections and YouTube, you can now easily browse, download and play newly released pay-per-view movies from Roxio CinemaNow(TM). You can also view videos on your TV from a wide variety of Internet sources, such as Hulu, Netflix(R) and CBS, through free software trials and optional subscriptions. The Digital Entertainer Live incorporates all of these functions into a single compact player, an advantage for cluttered home entertainment cabinets. If you are amassing a huge amount of downloaded and personal digital music, photos, and videos, as well as consuming more and more Internet video, then you should think about getting a solution that will integrate everything and the Digital Entertainer Live make it possible to watch online video on your HDTV. The Digital Entertainer Live is a compact, "plug in and go" home media player with a simple remote control that enables you to easily access your digital movies, videos, music and photos directly from your USB storage devices and watch them on your TV. You need only plug a USB hard drive containing digital media content into one of two USB 2.0 ports on the Digital Entertainer Live and connect the Digital Entertainer Live to your HDTV using an HDMI or composite cable. The Digital Entertainer Live also features regular RCA jacks for connecting to older analog TVs. With its integrated network port, the Digital Entertainer Live easily makes an Ethernet wired connection to the Internet and the home network, enabling access to digital media content stored on computers and network storage devices in the home network, as well as Internet content over the web. 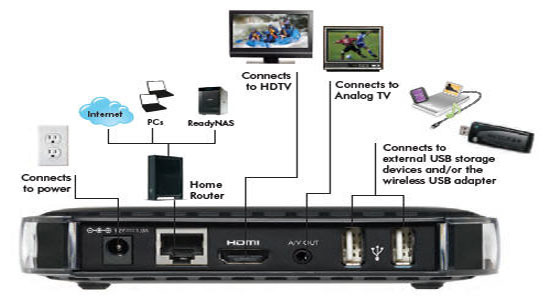 If you do not have an Ethernet connection available near your TV, you can use the optional Digital Entertainer Live Wireless USB Adapter (EVAW111) that connects the Digital Entertainer Live to the Internet and the home network via Wi-Fi(R). Alternatively, you can use existing electrical power outlets and a powerline device, such as NETGEAR's Home Theater Internet Connection Kit (XAVB1004), to connect the Digital Entertainer Live to the Internet and the home network. By connecting the Digital Entertainer Live to your broadband Internet connection you will enjoy the full YouTube experience - searching, browsing and watching millions of videos with access to subscriptions, playlists, country selections, categories and channels -- all without the need for a computer. Instead of huddling around a small computer screen to watch the latest funny video, you can now show it on their TV for everyone to enjoy. To widen the search for Internet video content, the Digital Entertainer Live is shipped with a built-in Internet video search engine that can locate videos on the entire worldwide web. The Digital Entertainer Live performs dynamic keyword searches of more than a hundred thousand websites for Internet videos without needing a computer. The search feature yields dynamic results with each letter inputted and automatically categorizes popular subjects into easy-to-find folders. The Digital Entertainer Live also supports pay-per-view movies on-demand from Roxio CinemaNow, where you can buy or rent a range of newly released movies as soon as they are available on DVD and watch them in minutes. You no longer have to wait for the mail or drive to the nearest rental store. You simply browse all the movies on your TV and download them to a USB storage device using your Digital Entertainer Live and Roxio CinemaNow account. Additionally, the Digital Entertainer Live includes a free trial of VuNow, which provides access to hundreds of other Internet videos, live Internet TV and live Internet radio streamed from popular sites from around the world, such as Bloomberg, CNN Video, C-SPAN, ESPN, Germany's 2DF, Al Jazeera, BBC Worldwide, China's CCTV, Germany's DWTV, Euronews, EuroSport, France 24, France's Orange Sport, Germany's RTL, and Sky News. The Digital Entertainer Live also comes with a free trial of PlayOn software. By running this optional software on a computer also connected to the Internet and home network. You can enjoy hit TV shows and movies from popular Internet video services such as Hulu, Netflix, Amazon Video On Demand, BBC iPlayer, CBS, NFL, the Australian Broadcasting Corp. and more, wherever the service is normally available via the Internet.